How would you rate your experience with Bumble ? Co-founder of Tinder, Whitney Wolfe Herd decided to start dating app Bumble soon after leaving Tinder. Founder of Badoo, Andrey Andreev partnered with Herd and gave $10 million in seed money to start the company. 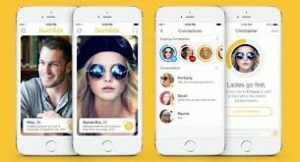 Bumble is different from other dating apps in that women make the first move. Men are not allowed to contact women first. A swipe on the phone to the right will “like” a profile, a swipe to the left to reject a potential match. While Tinder is currently the top dating app for those 18-35, Bumble is closing in fast. With an estimated value of $1.1 billion, Herd stated in September 2018 that the company was considering going public. The company reported 22 million subscribers in November 2017. Company headquarters are located in Austin, Texas. Question 1: What is the phone number for Bumble ? Answer 1: The phone number for Bumble is (502) 548-0215. Question 2: Who is the CEO of Bumble ? Answer 2: The CEO of Bumble is Whitney Wolfe Herd. Question 3: Who founded Bumble ? Answer 3: Bumble was founded by Whitney Wolfe Herd in 2014. Want to make sure Bumble sees your comment or complaint?